Looking for a quick way to remove duplicates in your Excel table? Or are you facing a challenge to compare two lists for differences and matches? 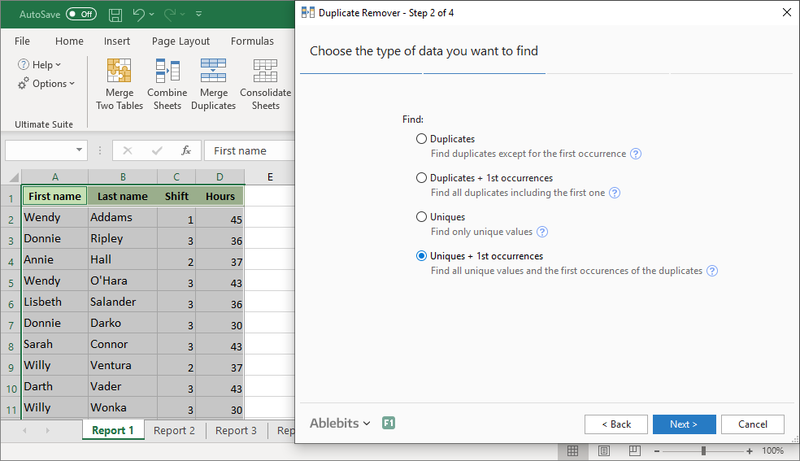 Whatever your task is, Duplicate Remover Toolkit can do it all: search for dupes in one table and in two different sheets, identify duplicate rows and highlight unique entries, move repeated values and copy uniques. Search for duplicates in one table Find all duplicates in your spreadsheet with or without first occurrences. Compare two tables for matches and differences Check for differences or matches in two Excel columns, lists, or tables of different size. Remove dupes in a flash Quickly dedupe your table and get rid of all repeated entries in one click. Choose one or several columns for comparison Whether you look for duplicates in one sheet or compare two tables, choose any number of key columns to check. Delete duplicate rows Identify and remove repeated lines that have the same value just in one column or in all selected columns. Find unique and distinct values Check for unique data only or include the first instances of repeated values in your search. Highlight and select dupes and unique cells Get duplicates or unique entries automatically selected or highlighted with any color of your choosing. Move duplicates or copy unique cells Copy unique values or move repeats to a new Excel sheet or workbook. Identify matches and differences in a status column Add a column with status marks to view duplicates and uniques at a glance. 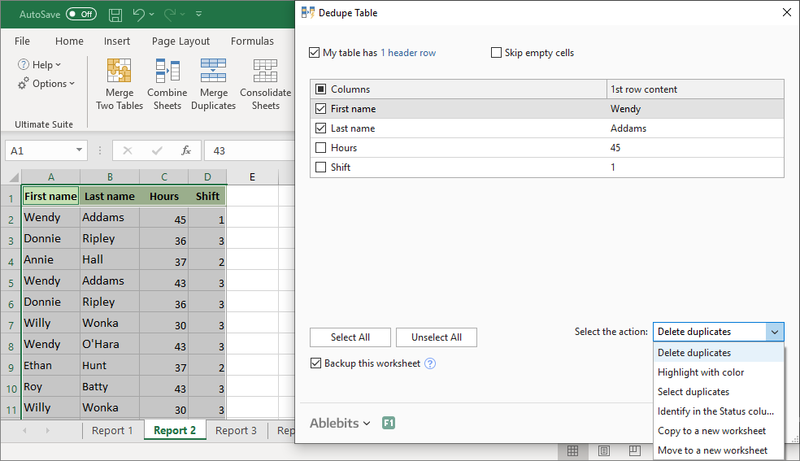 Deduplicate Excel tables of any size Our dedupe tools can process worksheets with any number of columns and up to one million rows. What is Duplicate Remover Toolkit for Excel? 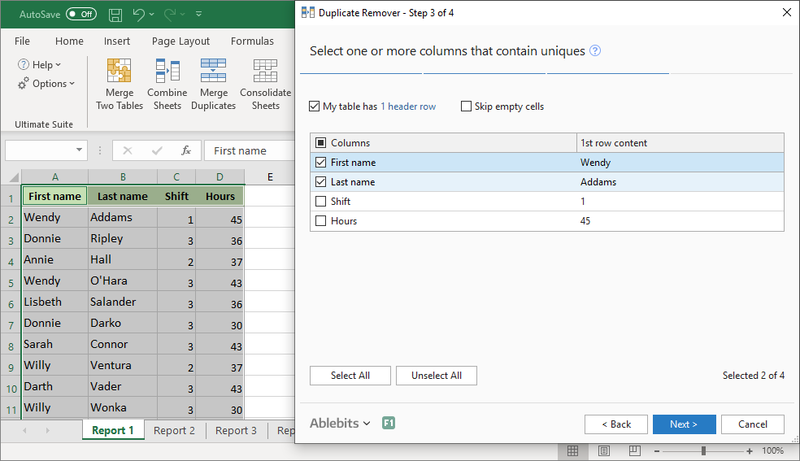 The Duplicate Remover Toolkit includes 3 tools that will help you out when you need to deduplicate your tables or find unique values in Excel. 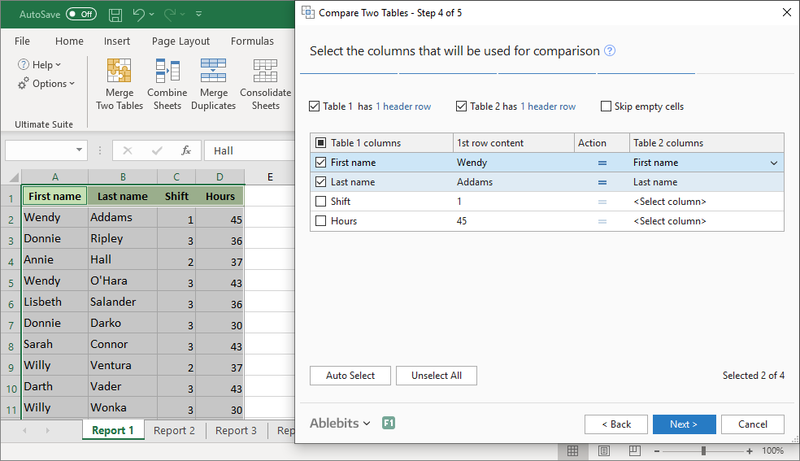 Compare Tables comes in handy when you are to find differences and matches between two Excel columns, lists, or tables. 5 quick steps, ability to select one or multiple key columns for comparison, and a handful of different options to deal with the found entries. Quick Dedupe is the option you use when you have just 1 list to search for duplicates. All is done on one screen and literally in a few seconds: you simply select the needed columns, choose what you want to do with the found entries and click OK. That's it. 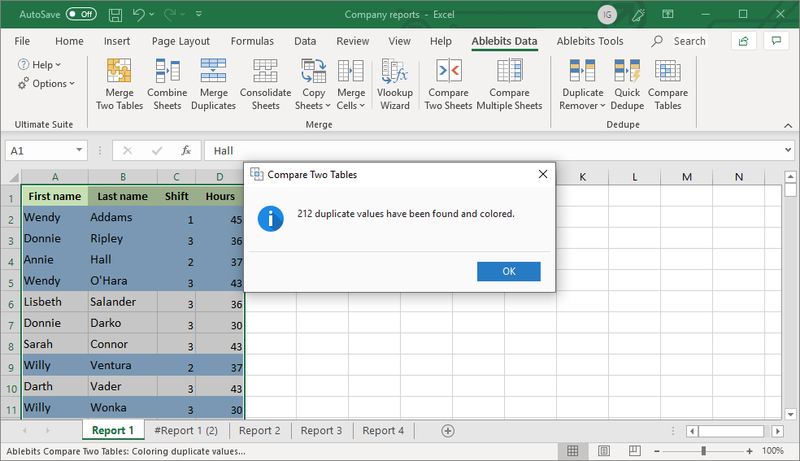 Highlighting or deleting duplicates in Excel has never been easier! What can Duplicate Remover Toolkit do that Excel's Remove Duplicates cannot? The built-in Remove Duplicates tool can neither compare two lists nor search for unique values. Plus, it only deletes repeated records. Find uniques and remove duplicates in 1 Excel table. Search for duplicate and unique entries in 2 tables by comparing key columns. Search in two lists with different number of columns. Choose columns to be checked for duplicates. 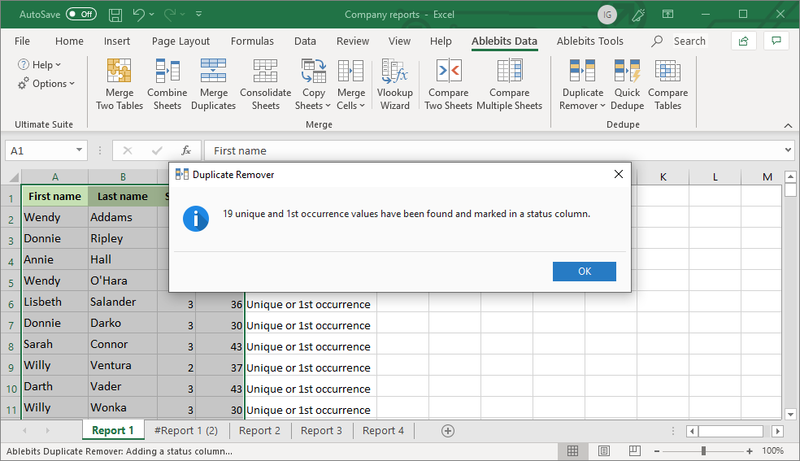 See how to find and remove dupes by key columns. Find and remove duplicate rows that have the same values in one, several or all columns. Identify duplicates and uniques in the way most suitable for you: select, highlight with color, mark with a status column, copy, or move. How to remove duplicates in two Excel columns or lists? If you need to find and remove duplicates in two columns, lists, or tables, Compare Tables is the tool you need. It can find all matches and differences between two datasets located in the same sheet or in two different sheets. Learn more about the Compare Tables tool here. The promptest way is to use Quick Dedupe. Select your range or just a single cell in your table, click the Quick Dedupe icon on the Ablebits Data tab, and choose the desired action: delete duplicates, highlight, select, identify in the status column, or move. Will the toolkit help if I need to get all duplicates selected? Sure. It is up to you whether the dupes will be selected, colored, removed, copied, identified in a status column, or moved to another location. What if I want to find absolutely all duplicates including first occurrences? The Duplicate Remover Wizard will definitely help. On the second step, you choose Duplicate + 1st occurrences. If your task is to find duplicates without 1st instances, choose Duplicates. Learn more about Duplicate Remover here. Can I compare two Excel lists and find unique values in the main list? Sure. To find unique values in your main table use the Compare Tables add-in. On the third step select to search for unique values, then indicate the columns to use for comparison, and specify the desired action for the found entries: highlight or select values, identify them in the status column, copy the uniques to another worksheet or Excel book.